Perhaps you'll remember my Autumn Arrowhead quilt block. In case you don't, check out this post to see how this SUPER easy block is constructed. (When I say SUPER easy, I mean it...I sewed all of my blocks for this quilt in under 2 hours.) While these blocks can certainly be pieced side by side, I tried something different for this quilt. My sister and I decided that our favorite aunt should have a quilt made with this block for her birthday this year. We divided up the fabric and each made 10 blocks. We used the same neutral gray fabric for all of the blocks and a variety of solids and prints in a colorway we think she'll like. I added sashing and cornerstones when piecing the top, and I think it really added to the overall design. 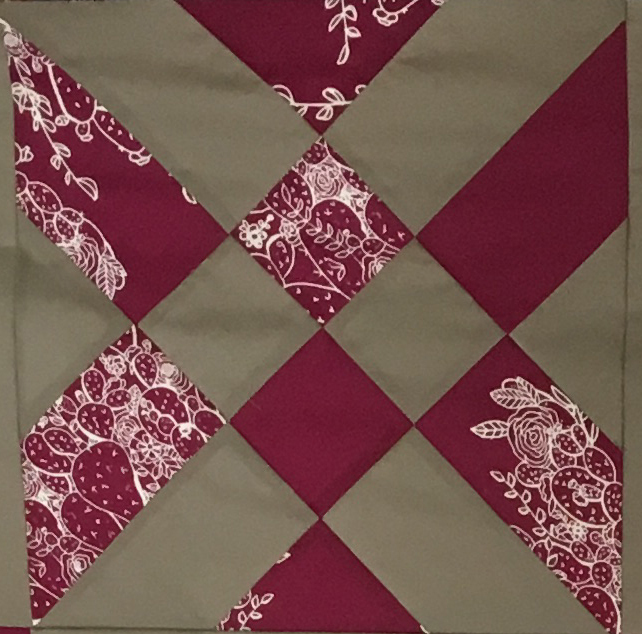 I used free motion quilting in the neutral spaces of the blocks, and some straight-line quilting in the sashing, leaving the prints/solids unquilted. I'm usually a very dense-coverage sort of quilter, so this was a new approach for me, and it makes the prints really pop. Now all we have to do is bind it and gift it! When your teen daughter can no longer sit up in her bunk bed without conking herself on the ceiling, it's time for a bedroom makeover. New furniture was a necessity, new paint just made sense, and that left me with no choice but to make new quilts. I decided to make the girls the same quilt pattern from the same line of fabric, but did my best to make them look different enough that it felt like each quilt was uniquely tailored to each girl's taste. I selected Tucker Prairie Fabric by 1Canoe2, and this free quilt pattern from Moda's Bake Shop. The bulk of the quilt is made from jelly rolls - what a time saver! I haven't worked with jelly rolls very much, but they worked great for these quilts. The remaining pieces are made with HST's, so these quilts sewed up very quickly. For each girl, I selected different focal fabrics from the line, and then altered the placement of my jelly roll strips to look best with those fabrics. I think it worked out well - they look like completely different quilts while still complementing each other!